The D2 Center recently received a $10,000 grant through Doris Buffett’s Sunshine Lady Foundation and the University of Nebraska at Omaha’s Learning by Giving philanthropy class. The class of undergraduate and graduate students divided into four groups, researching four local non-profits and writing grant proposals on their behalf, then debated which organizations would receive a grant. 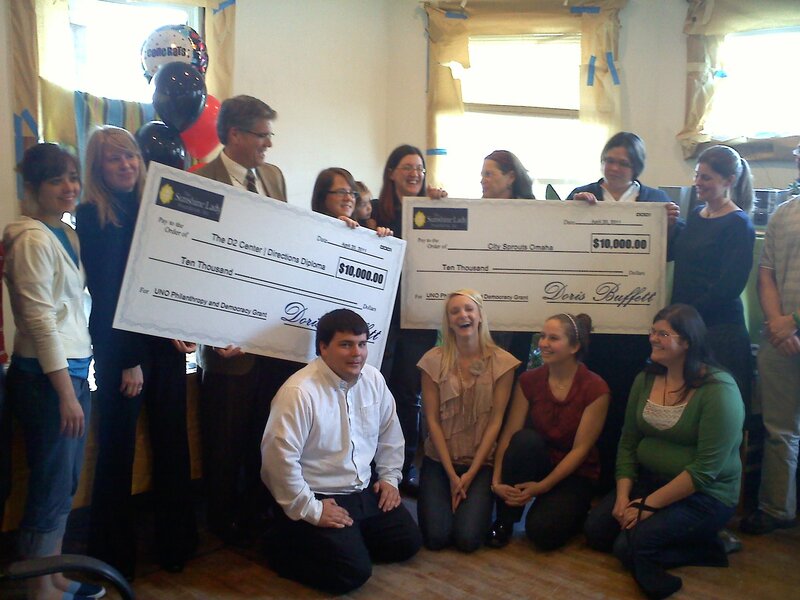 After visiting the class in April, Ms. Buffett doubled the initial amount, resulting in two $10,000 grants. The D2 Center was awarded $10,000, along with City Sprouts, a group who runs a community garden in North Omaha and educates residents about gardening, the environment, and nutrition. “It’s an honor to be considered, and we’re thrilled that the class chose the D2 Center as one of their grantees,” said director Carolyn Miller. The Building Bright Futures D2 Center re-engages disengaged and out-of-school youth in an educational pathway and connects them to community resources to support them. The Sunshine Lady Foundation grant will be used to support the Youth Academic Navigator (YAN) component of the D2 Center program. Because many disengaged youth lack the steady support of an adult to guide them through their high school years, the D2 Center will provide YANs – adults who monitor D2 Center students’ school attendance, grades, and credit completion as well as participation in other community resources. YANs communicate with other key adults in the youth’s life and diagnose barriers to success on an ongoing basis in order to keep the youth on track for graduation. This summer the D2 Center is piloting their program with small groups of students and will be opening their doors more broadly later this fall. If you have questions, please contact D2 Center directors Greg Emmel and Carolyn Miller at 402-502-8534. Thank you, Sunshine Lady Foundation, the UNO Learning by Giving class, and Ms. Doris Buffett! Read more about the Sunshine Lady Foundation and UNO’s Learning by Giving class in this Omaha World-Herald article and in this video from UNO.